Just before baseball starts up again and right after football comes to a close, basketball fans are treated to the NBA All Star Weekend. This year, the best of the best from the Eastern and Western conferences square off at the Staples Center in Los Angeles, California. Unlike any other professional All-Star games, the NBA All-Star events last an entire weekend, beginning this Friday night, February 18th. It all starts with the celebrity game at 7pm. This year, teen pop sensation Justin Bieber will be participating in the celebrity game, where he will join other notable names such as Lakers Hall of Famer Magic Johnson and Bulls great Scottie Pippen. Right after the celebrities get off the court, the NBA’s best rookies prepare to play the sophomores in the Rookie vs. Sophomore showdown! The rookie team is coached by Knicks All-Star Amare Stoudemire and the sophomore team is coached by Denver Nuggets All-Star Carmelo Anthony. Who knows? By February 24th, these two men can be teammates with all the trade rumors going around surrounding Carmelo Anthony. The sophomores usually dominate this game, but last year the rookies broke the winning streak of the sophomores, their first victory since 2002. With Clippers star rookie Blake Griffin on the team, the rookies have a strong chance of starting their own winning streak. Saturday’s events are the main highlights of the weekend. It all starts off with the Shooting Stars Challenge. Team Atlanta, Team Los Angeles, Team Texas and Team Chicago face off in an “Around the World” shooting contest. There are six different locations on the court from where the players have to shoot. The teams consist of one current NBA player, one hometown legend, and one WNBA player. The next event is the Skills Challenge. This event has four players passing the ball into nets, taking various shots and moving around fake mannequin defenders. Whoever completes the course in the fastest time wins. The best point guards in the game compete in this event, so be on the look out for the pure talent these men have in this competition. Following the Skills Challenge is the 3 point shootout. Paul Pierce looks to defend his title against Celtic teammate Ray Allen, Thunders’ Kevin Durant, Daniel Gibson of the Cavs, James Jones of the Heat, and Dorell Wright of the Golden State Warriors. Keep an eye out for Kevin Durant in the Foot Locker 3 Point shootout. 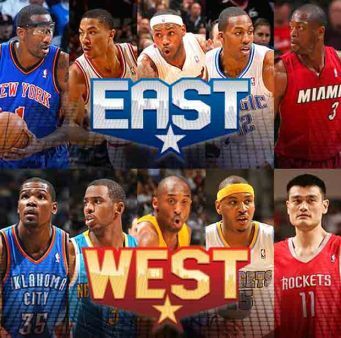 The East vs. West matchup takes place on Sunday night. But the Sprite Slam Dunk contest on Saturday night is much looked forward to by all fans. After a dismal contest last year, NBA fans are hoping Blake Griffin can shine this year. He has been dunking the ball all year long and fans are eager to see what he will do in the dunk contest. Griffin’s challengers include DeMar DeRozan of Toronto, Serge Ibaka of the Thunder and JaVale McGee of the Wizards. Many feel it’s Griffin’s contest to win. *Yao is injured and won’t play, but was voted to be the starter. Minnesota forward Kevin Love will take his place, making his first all-star appearance. Dwyane Wade is looking to become a back-to-back MVP of the game and lead the East to victory once again. They will face tough competition from the West. In a game that’s sure to see jaw dropping plays and thunderous slam dunks, the fans are in for a treat. Live from L.A, the 60th annual NBA All Star game starts at 8pm on TNT.